A registered dietitian shares her top tips for losing those last five pounds. It’s a fair statement to say that at any one time, a large percentage of us are trying to lose weight. As a registered dietitian, I see this in my own practice — at least 50 percent or more of the individuals who come in to see me are doing so with the hopes of dropping at least 20 pounds. It’s not easy, and many fall short of their goals. Their failures are not due to a lack of motivation or willpower; it’s often because they tried to make too many big changes all at once. Even their goals were too big. In fact, one study found making smaller and easier changes to eating habits on a regular basis was more likely to yield success in weight loss. 1. Rethink your favorite coffee. Instead of having a high-calorie, high-sugar caramel latte, consider a coffee with unsweetened almond milk and cinnamon instead. You can whip up the almond milk and add tons of yummy flavors with the cinnamon, all while saving you over 1,600 calories a week, which could amount to over 20 pounds lost in one year! This is an obvious one, but probably one of the most challenging to implement. We still are drowning in soda, and it’s costing us our health. But giving up a 12-ounce can of cola (140 calories) for water, or a naturally flavored seltzer water, can help you lose up to 14 pounds a year. Just make sure you resist the urge to cut calories by incorporating a diet version of your favorite cola. Artificial sweeteners may have consequences to your weight as well, according to several recent studies. 3. Try zoodles instead of pasta. 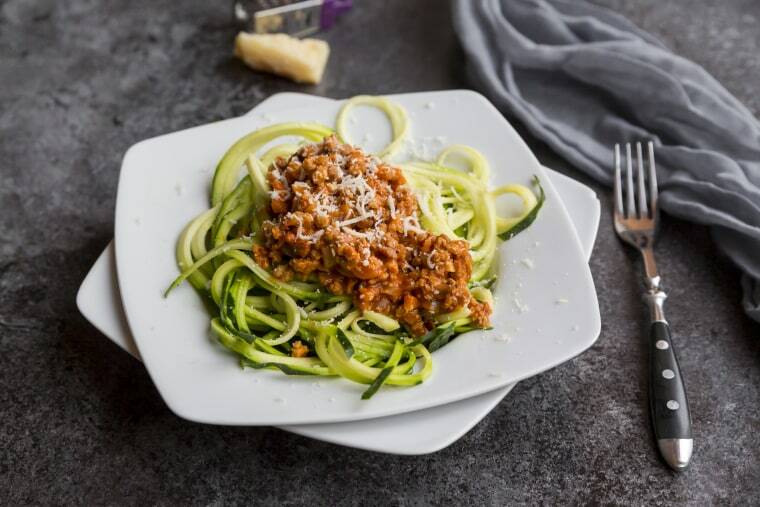 Eating zucchini noodles instead of pasta, just once a week, can help you lose over 2 pounds in a year — and making it all the time can lead to even further weight loss. This habit can be especially helpful for individuals with diabetes or non-alcoholic fatty liver disease by decreasing the reliance on insulin. 4. Stay away from sugary, alcoholic drinks. Alcohol can be a real challenge when you’re trying to lose weight, but it can be the kiss of death if your alcohol of choice tends to be one that’s potentially loaded with sugar. Daiquiris, piña coladas and margaritas all fall into this category. Consider swapping your margarita for a 5-ounce glass or red or white wine just three nights a week and you can save you up to 1,000 calories a week, or 15 pounds in one year. 5. Make your own salad dressing. Swap high-calorie dressings for an amazing oil and balsamic vinegar combination to shave off about 3 pounds per year (that’s a lot to the serial dieter always looking to lose the last 5 pounds). Think an oil and balsamic combo is boring? Think again. My view of salads and what goes on them completely changed when I found a specialty oil and vinegar store near my house. Now I whip up delicious masterpieces like blueberry balsamic paired with lemon olive oil, and quince balsamic paired with lime olive oil. I’ve fallen back in love with salads that were getting boring, and I fit better in my jeans because of it. 6. Find a healthier afternoon snack. If I told you to swap your mid-afternoon bag of potato chips for some celery and hummus, you’d probably think I was crazy. So instead of having potato chips every afternoon, swap them for crunchy Parmesan crisps that you either make you or buy. While calories may differ by brands, some popular options I looked at showed a serving of potato chips running about 140 calories, while a serving of Parmesan chips having only 100 calories — and almost no carbs! That’s a potential savings of over 250 calories a week. Cauliflower rice is found nationwide in either fresh or frozen versions and is easy to prepare. Plus, cauliflower is one of the best vegetables to consume if you’re interested in reducing your risk of cancer. If that doesn’t motivate you, then how about this: Cauliflower rice has 40 calories in one cup, while white rice has 170. That’s a saving of 130 calories! If you make that change just three times a week, you can save about 20,000 calories in a year. Remember, weight loss is based on many variables — calories are only part of the equation. Genetics, activity level, gender, age and disease status all are factored into your ability to lose, or maintain weight. Despite this, small lifestyle changes, like swapping some of the foods suggested here, may help to move you in the right direction. Kristin Kirkpatrick, MS, R.D., is the manager of wellness nutrition services at the Cleveland Clinic Wellness Institute in Cleveland, Ohio, and the author of "Skinny Liver." Follow her on Twitter @KristinKirkpat. For more simple swaps to improve your life, sign up for our One Small Thing newsletter. This article originally appeared on TODAY Health & Wellness.